Secretary of State for International Development, Priti Patel launched the DFID Economic Development strategy at the African Union Summit in Addis Ababa. There is no task more urgent than defeating poverty. The UK has a proud record of supporting people in desperate humanitarian crises, but emergency help alone won’t tackle the global changes we face. 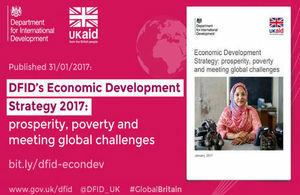 Developing countries want to harness trade, growth and investment opportunities and Britain will lead the way to lift huge numbers out of grinding poverty to prosperity. The department will work across government to increase the number and quality of jobs in poor countries, enable businesses to grow and prosper, support better infrastructure, technology and a skilled and healthy workforce. Today’s announcement builds on the UK’s existing work to drive economic development, which has helped almost 70 million people access financial services, over 6 million people improve their land and property rights, and improved access to clean energy for over 6 million people.